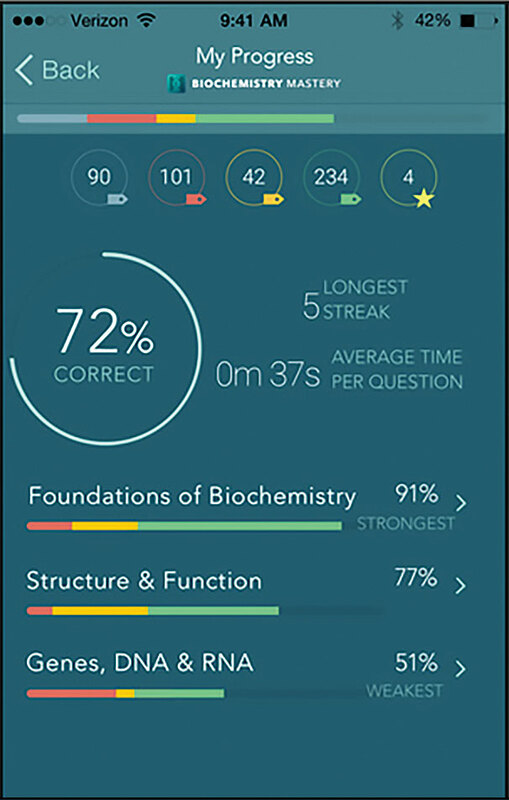 A useful study tool for students of biochemistry, the Biochemistry Mastery app provides a large bank of over 400 questions that test students’ knowledge in three broadly defined categories: foundations of biochemistry; structure and function; and genes, DNA, and RNA. Within each general category, questions are further subdivided by topics that can be individually studied. (Alternatively, users can choose to mix all questions together.) For example, topics contained within the structure and function category include transport, catalysis, and lipid metabolism. Each individual topic corresponds to approximately 20 questions. After submitting an answer to a question, students have the opportunity to view an explanation of the correct answer and the option to sort that question into one of three different “flashcard piles”: don’t know, somewhat know, and know. These different piles are conveniently color-coded, so that students can easily identify the topics that require the most studying.